The New York Knicks practiced Monday for the second game of their preseason tour, with Amare Stoudemire promising to have fun in Paris despite warnings of a possible terrorist attack in Europe. The Knicks play the Minnesota Timberwolves on Wednesday. 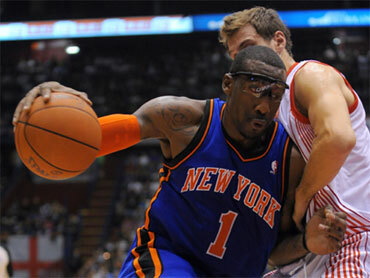 They defeated Olimpia Milano 125-113 in Milan on Sunday behind Amare Stoudemire's 32 points. "We know where to go and the places to visit and again, you have to cherish the moment because it's not often you get a chance to play an NBA game in Paris," said Stoudemire, who joined the Knicks from the Phoenix Suns this summer. "So we got to make sure we enjoy it and have fun." The U.S. government issued a travel alert Sunday, urging Americans to be vigilant in public places, tourist spots and transportation hubs. The NBA has said it will take "all appropriate security measures" for its teams touring Europe. Knicks coach Mike d'Antoni said his players didn't receive any particular do's and don'ts while in Paris. "Nothing out of the ordinary. It's all good procedures, standard procedures and they'll follow them and we are just going to do what's right," D'Antoni said. The Los Angeles Lakers are also part of the tour. They play the Timberwolves in London on Monday and the European club Barcelona in Spain on Thursday. On Monday, French authorities arrested a man in his 50s who is suspected of several bomb threats in Paris, including one at a railway hub, a police official said. The man, who was not identified, was detained southwest of the capital on suspicions of links to a phone-in threat at the Saint-Lazare train station. French authorities have recorded nine bomb alerts in the capital last month, including at the Eiffel Tower - a threefold increase from a year earlier. No explosives were found.